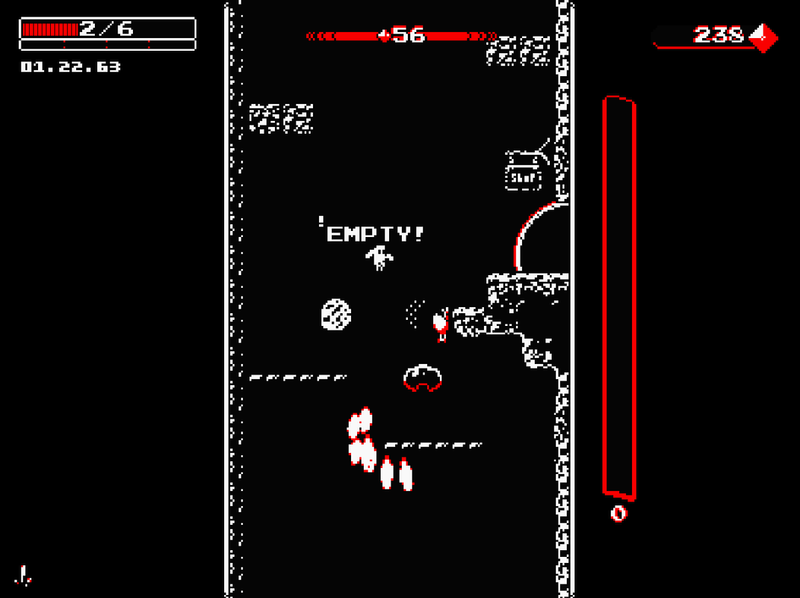 Home » Downwell Review: Well? Where? Down! Take the role of a curious young person as they venture…well, down (a well). Equipped with nothing more than a pair of trusty gun boots, search for untold treasures and make your way deeper into the darkness. Nasty creatures and mysteries secrets lie in wait for your discovery. Collect red gems, equip power-ups, and level up this precocious explorer to battle well-dwelling monsters and uncover hidden caves. No two trips are the same, enter: Downwell. *Doesn’t it seem like every story starts with the main character asleep? They’re dreaming this for sure. Downwell, developed by Moppin and published by Devolver Digital, is a procedurally-produced, rogue-lite game featuring a typical gameplay mechanic that has been turned upside-down. Many of us retro gamers are familiar with the standard top-down, scrolling shooters featuring spaceships or World War II airplanes, but Downwell combines this mechanic with extremely tight platforming to create an entirely new experience. *When you run out of ammo, you’ll have to land carefully to reload without damage! Levels are freshly assembled for each playthrough, combine this with different weapon types and upgrades, and you’ve got a truly robust experience. These levels change based on how long you can keep your one life going, those who are more skilled will reach deeper into the well and onto more challenging levels. Ammo comes in the form of ‘bullets’, represented as a bar on the right side, each time you land, this bar refills, acting as an automatic ‘reload’. Ammo is also released if an enemy is stomped on, providing the ability for lengthy combo chains if the timing and execution are right. *The action moves fast, stay on your toes! Periodic breaks from the action are provided in the form of shops, this is an optional feature, as there are other modes which remove this mechanic for a greater immersive experience. Health power ups are available from the shops, while weapon or other upgrades can be selected in between levels. 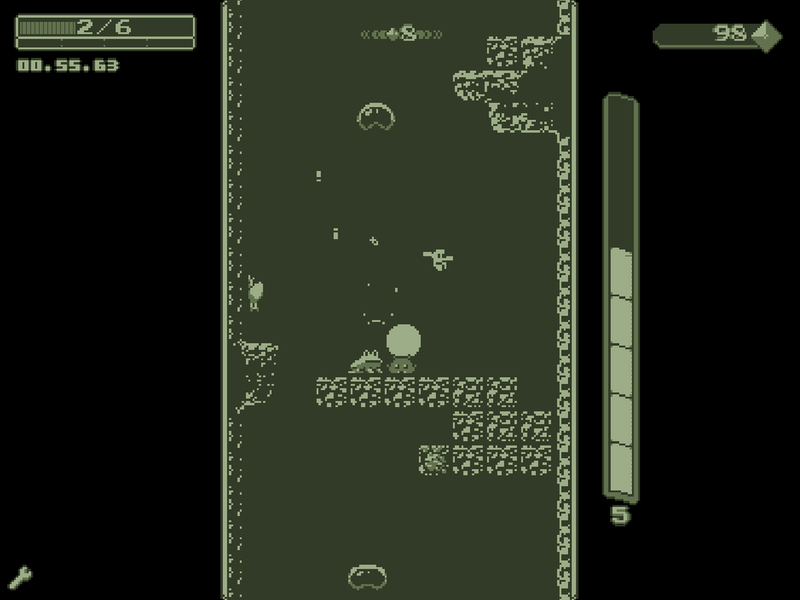 There’s not much to Downwell in terms of storyline, it is all gameplay based. Personally, I don’t see this as a bad thing. The gameplay IS the storyline, and it is riveting. The immersive presentation is exactly what every gamer wanted the Super Nintendo to do over 20 years ago, only now is technology providing the capabilities for pixel art games to live up to our imaginations. 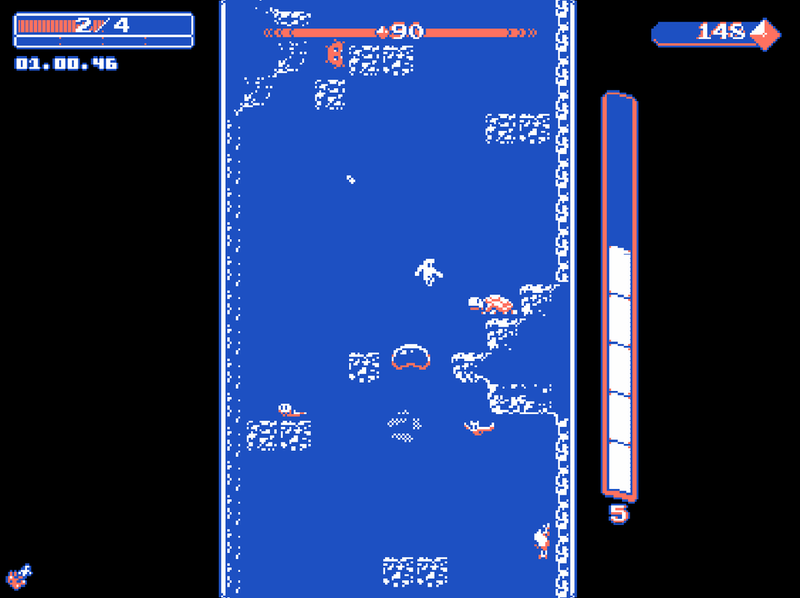 Downwell requires an immense amount of skill to play well, and the simple 3 tone graphics enable the perfect contrast to recognize threats with extreme accuracy. Different themes are unlockable as you progress further into the game, collecting XP along the way. Not only this, but different body types are also available, providing variation for gameplay styles. *The dingy green of Game Boy original, smoother than 1989 could ever. 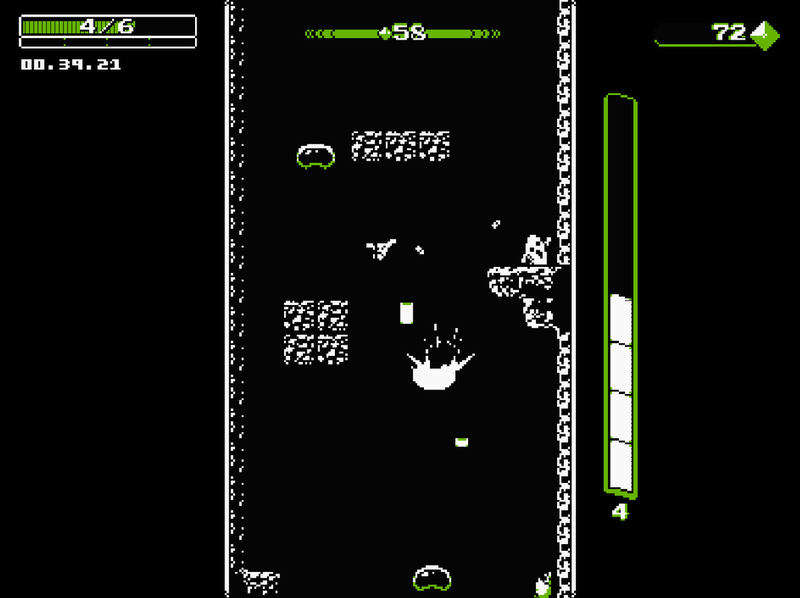 All shooting of enemies happens in a downward direction, stemming from the ‘gun boots’, it’s not a whole lot different from games like Jetpack Joyride, although Downwell is presented in a slick 60 FPS 8-bit graphical interface. The physics engine is very fluid and allows for long-chain combos given the skill level of the player. Longer combos equate to more XP earned by the end of each level. There are no limits to the combo chains that are possible. Downwell features a very 80’s chiptune-esque soundtrack; providing a retro theme that blends well with the gameplay and visuals. 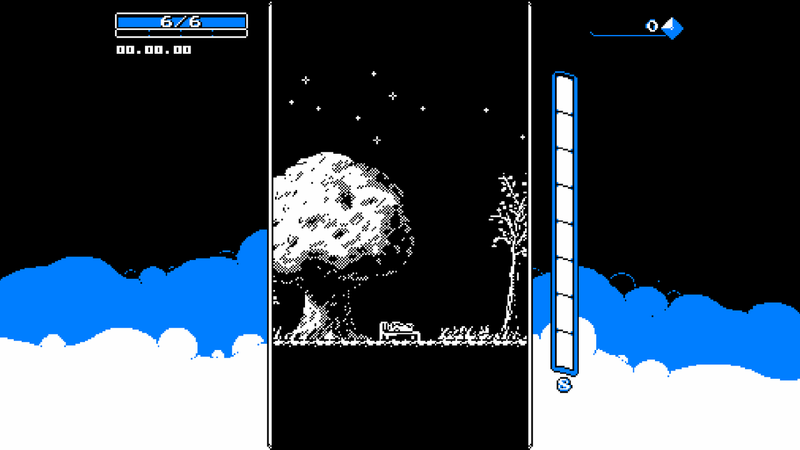 The music changes with each level, enveloping the player in a new environment as the enemies and other platforming challenges increase. *The action only gets harder and more busy as you descend. 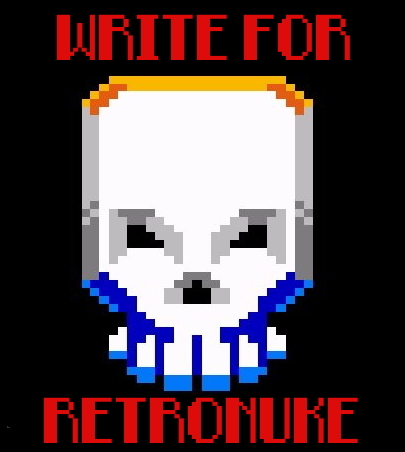 As with most pixel art and retro style video games, the music provides a necessary amount of tension in order to heighten concentration during the more demanding sections. 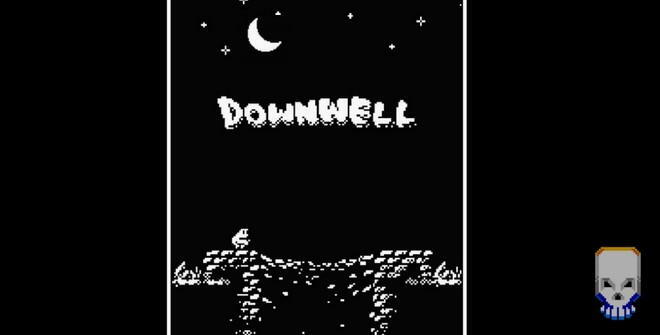 Downwell is no exception. Stomping on enemies & unloading lasers from your gun boots is the ultimate satisfaction. Downwell is a masterpiece; for a game that’s only asking $3 (on Steam), you absolutely cannot go wrong with this purchase. Fluid graphics, a fulfilling challenge, and replayability to-boot (pun intended), there’s not a single reason to deprive yourself of such a well-crafted pixel art game. *Different backgrounds keep the contrast high, depending on your mood! Stop reading this review, go buy the game, and play it yourself. Every retro gamer deserves this in their library. About 20 hours were poured into the well before the writing of this review. I still don’t know what lies at the bottom. Well, you down? Race ya.